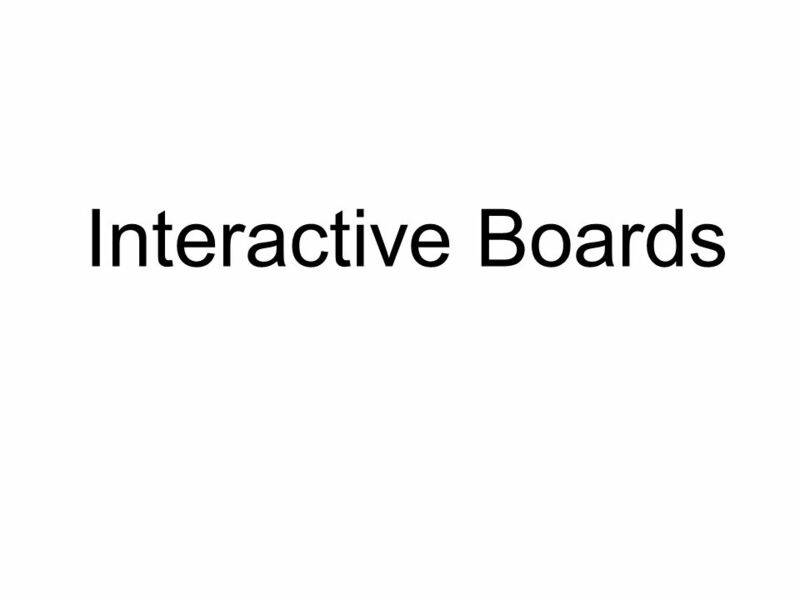 Interactive Bulletin Boards and Other Quick Ideas Submitted by Misty Hadaway, Carroll College. 3 Quote Board The upper left says, This is your quote board, so add your quotes, thoughts, etc. 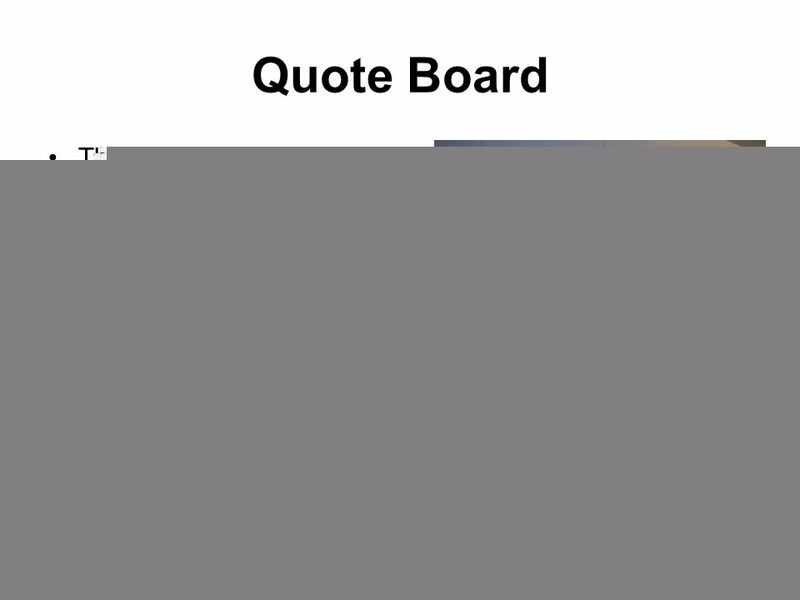 The upper right says, Can I quote you on that? In an envelope post markers so that residents can write on the board without having to go back to their room to get a writing utensil. 4 Embrace Diversity Diversity is really important so this is a great board at the beginning of the year. The top sign says, Many different backgrounds + many different stories = one big happy family _____ (insert name of floor) The bottom sign says, embrace diversity. 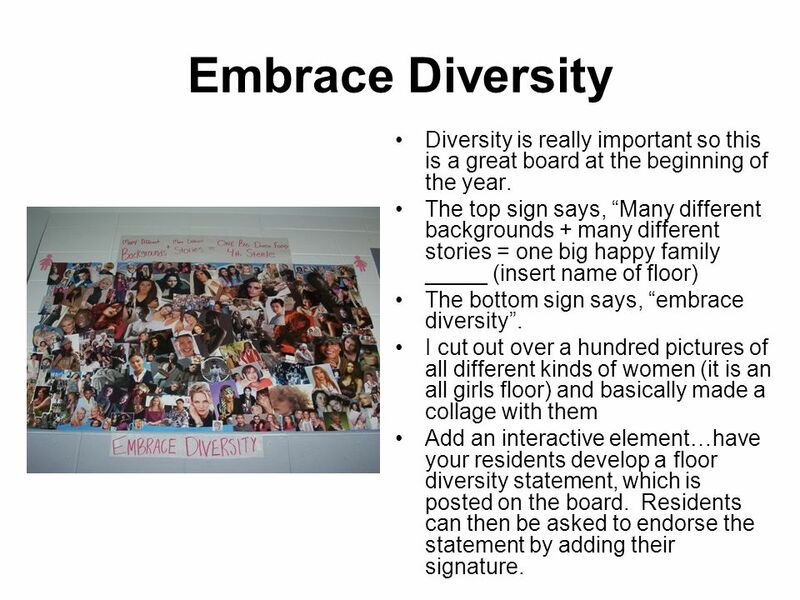 I cut out over a hundred pictures of all different kinds of women (it is an all girls floor) and basically made a collage with them Add an interactive element…have your residents develop a floor diversity statement, which is posted on the board. Residents can then be asked to endorse the statement by adding their signature. 5 What are your summer plans? 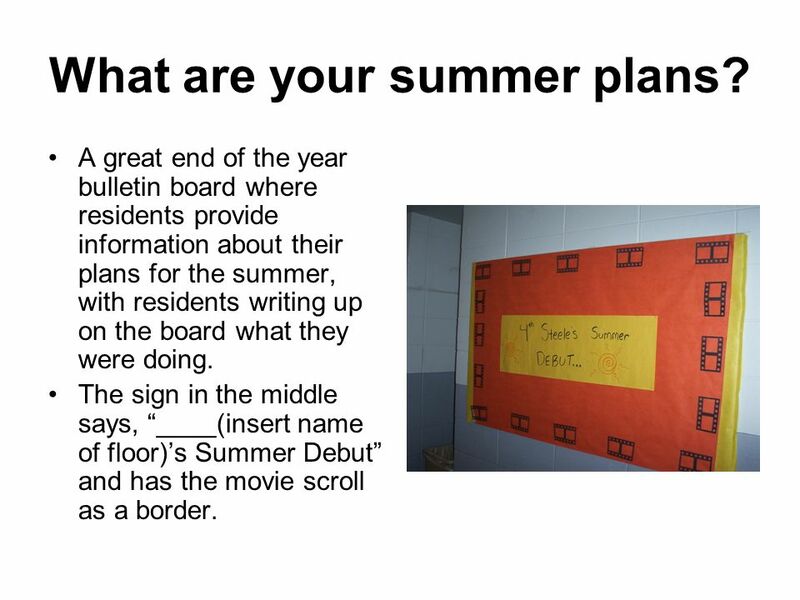 A great end of the year bulletin board where residents provide information about their plans for the summer, with residents writing up on the board what they were doing. The sign in the middle says, ____(insert name of floor)s Summer Debut and has the movie scroll as a border. 6 Its Time to Get Involved Its time to get involved with little clocks made out of the small paper plates. The little papers are the names of the organizations on campus. 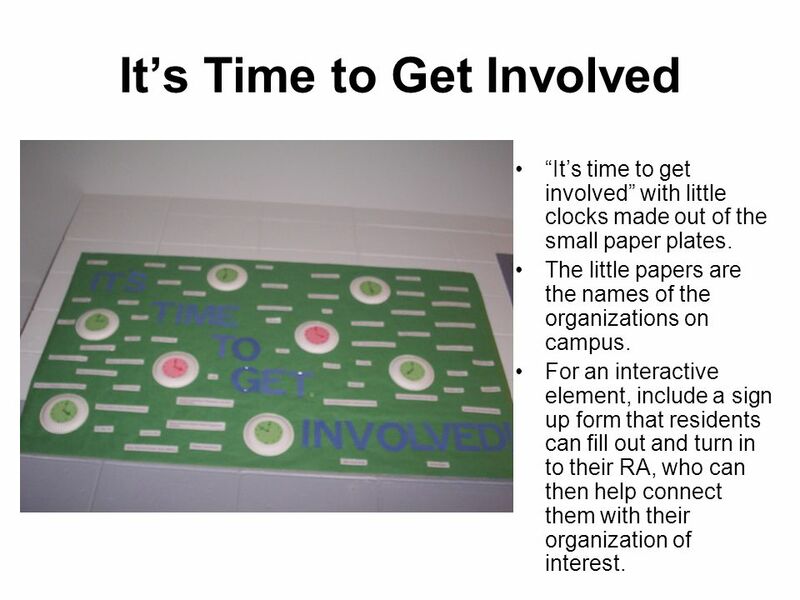 For an interactive element, include a sign up form that residents can fill out and turn in to their RA, who can then help connect them with their organization of interest. 7 Flattering Fridge This was our flattering fridge. 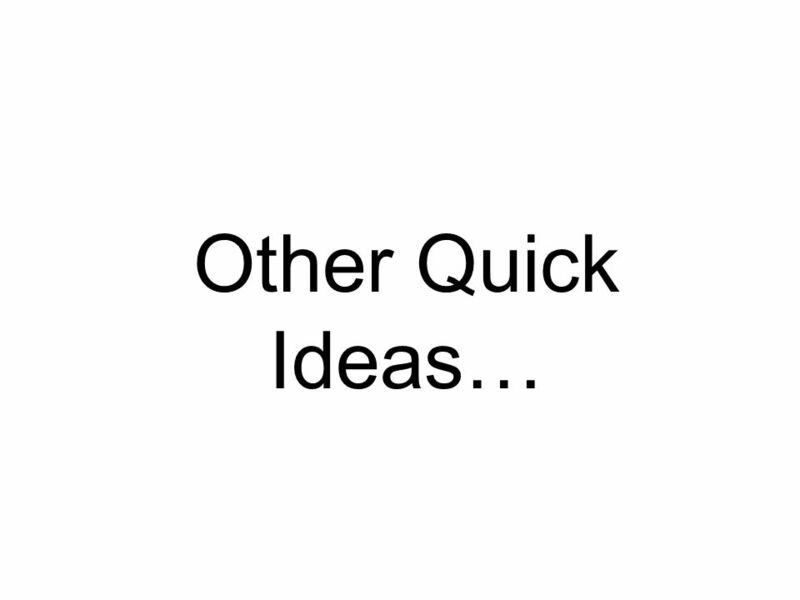 Create a flattering fridge sign and directions, and place these with post it notes and pens on the floor refrigerator. 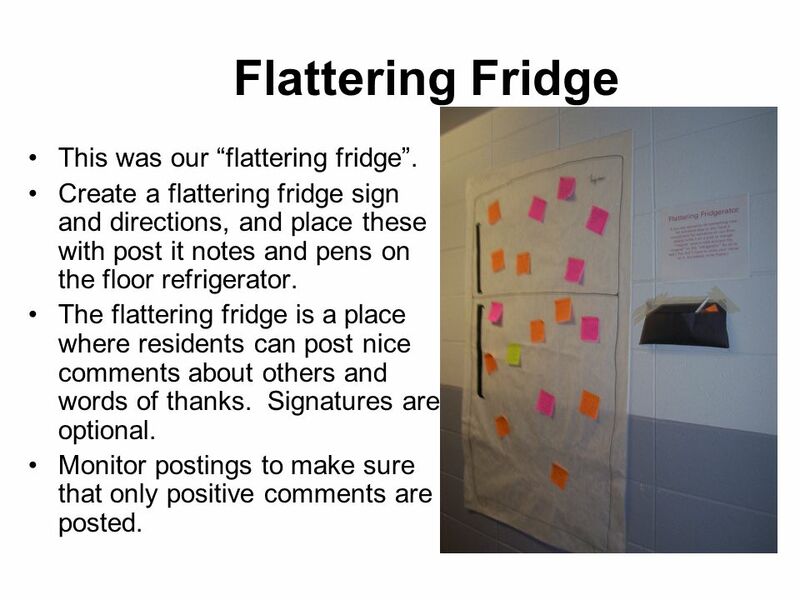 The flattering fridge is a place where residents can post nice comments about others and words of thanks. Signatures are optional. Monitor postings to make sure that only positive comments are posted. 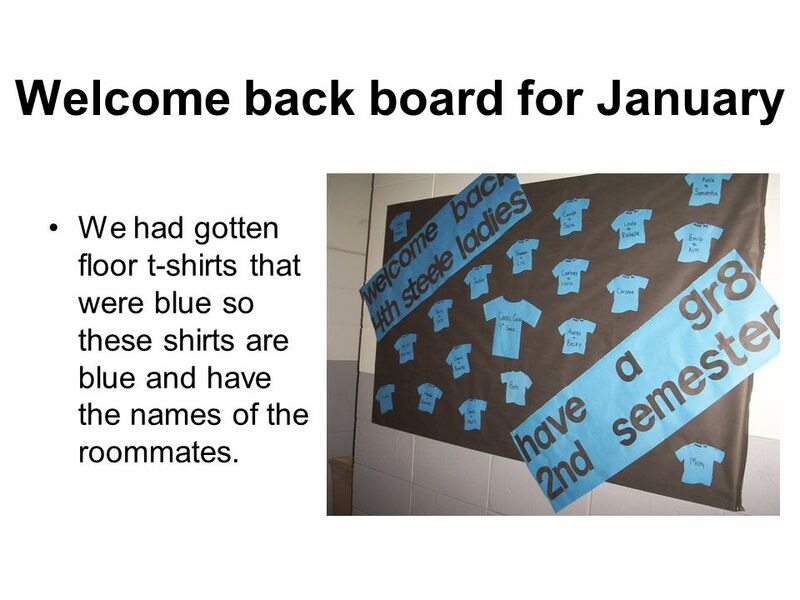 9 Welcome back board for January We had gotten floor t-shirts that were blue so these shirts are blue and have the names of the roommates. 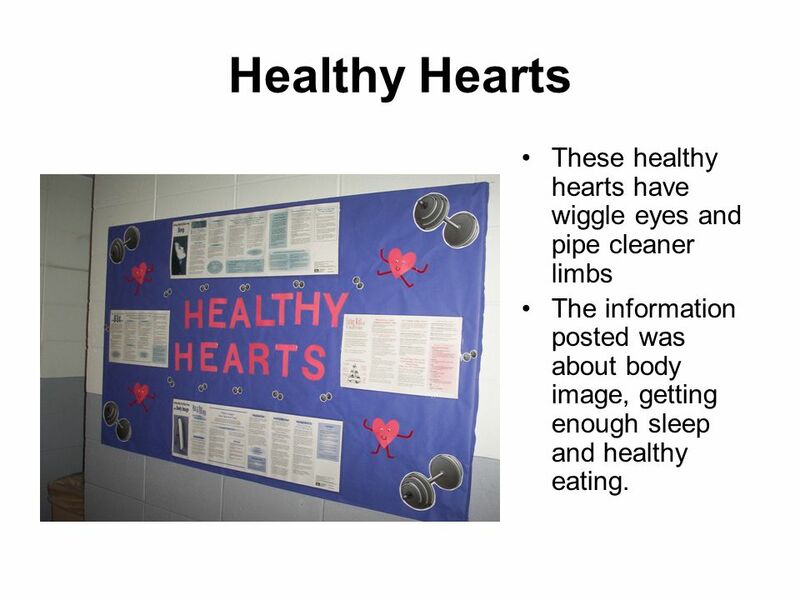 10 Healthy Hearts These healthy hearts have wiggle eyes and pipe cleaner limbs The information posted was about body image, getting enough sleep and healthy eating. 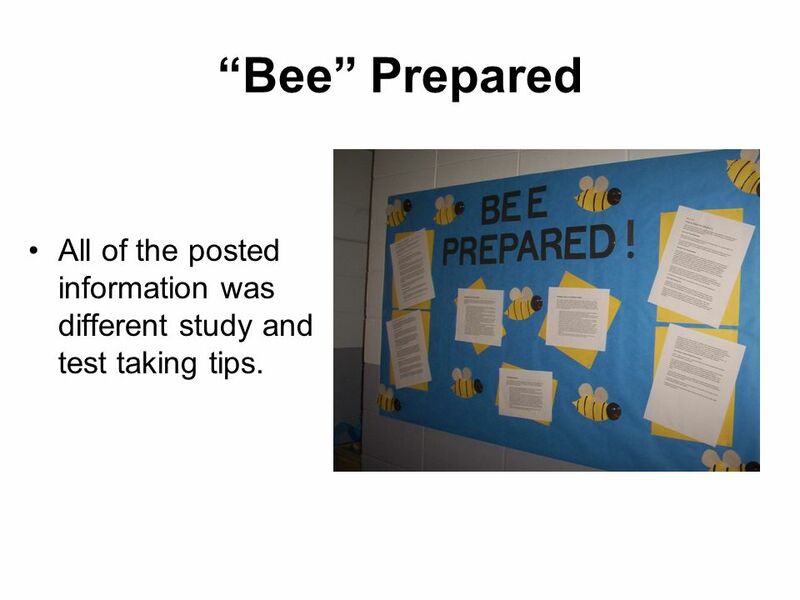 11 Bee Prepared All of the posted information was different study and test taking tips. 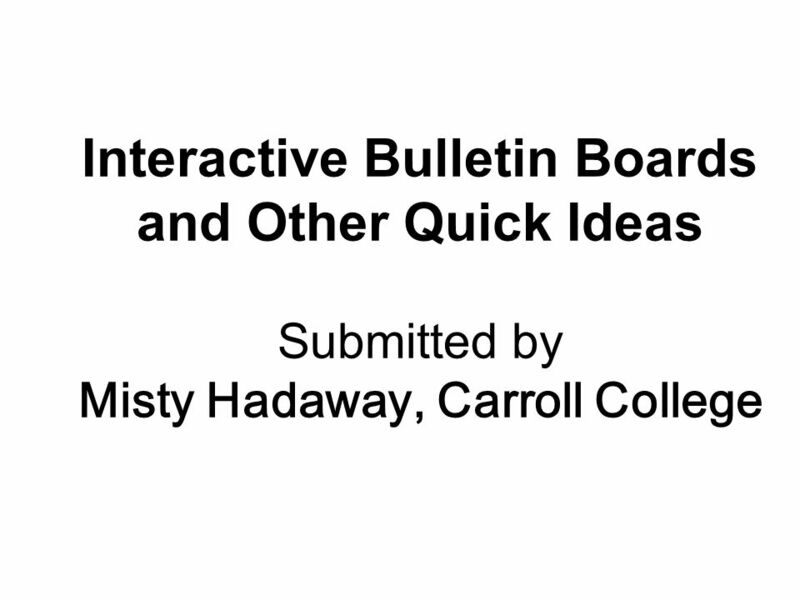 Download ppt "Interactive Bulletin Boards and Other Quick Ideas Submitted by Misty Hadaway, Carroll College." Lessons Learned from textsfromlastnight.com. (567): i feel like the dude nobody likes from the mikes hard lemonade commercial. There is no need to feel. At the beginning of the semester I was trying to think of a theme for my hall. I went with stars. I made star door tags and then a bulletin board that. Focus on the main part of the picture at the beginning. Look at this picture. What can you see? - The picture shows… - In the picture you can see… - It. By: Lia, B. & Sloane G.. Introduction “Welcome to the Love Canal, known to be a dream community…NOT! Wondering why? Well, the Love Canal didn’t turn out. Bulletin Board Idea To Prevent Vandalism: Bubble Wrap!!! Kyle Reimer Residence Director SUNY Fredonia Fredonia, New York. A “SLICE OF ME” Prepared by Alice Mullis October 2013. POWERPOINT May 2004 To move the text box - move the mouse over the border of the text box, and once the 4-way arrow appears - click and drag the box to. Welcome Welcome to the first tutorial of this communication system website! This “General” tutorial is for everyone! The next tutorial is for church planters.  Microsoft Publisher is an easy to use desktop publishing application. It is different from Microsoft Word in that the emphasis is placed on page layout. Vocabulary Back Ground Middle Ground Foreground Silhouette Collage. Spring Made Easy There are so many fun things to do in the spring.